Your guide to spearfishing in south Florida. 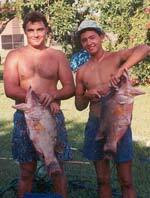 Welcome to the online resource for informaion on spearfishing in south Florida. This site gives you an idea of what spearfishing in Florida is like and features pictures, downloadable underwater video, dive spots and general information. Check back often for updates and send in your pics if you want to have them posted. Spearfishflorida.com strongly respects the environment and suggests fellow spearfishermen/women always follow current regulations and bag/size limits. 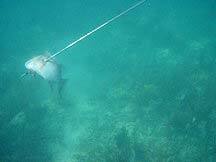 Abuse of the ocean will eventually lead to no spearfishing in Florida! (Pair of 11 lb. Hogfish in pic to left). (Mutton) 28 lbs. 5 oz.